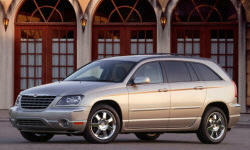 Chrysler Pacifica Pros and Cons | Page 1 of 2 | Why Not This Car? What drives people to buy (or not buy) a certain car? TrueDelta's members share Chrysler Pacifica pros and cons based on their real-world driving experiences. If I could describe this car in a single word, that word would be "smooth". Everything about how this car rides and drives is smooth. Ahead of its time! Chrysler did it right. Luxury feel, features, and performance with soccer-mom function. Chrysler innovated the first cross-over with style! This is by far the most comfy and room car I've owned. Great for tall people. My 6'5" son can drive it in comfort and sit in the 2nd row and not be cramped in the least. My Pacifica is well built. We have owned our Pacifica for 3+ years and put over 40k miles on it now (bought at 59k, now has 100k). It has been a great family vehicle and has needed typical repair and maintenance, but nothing major. We rented a Pacifica in 2004 to drive from Fort Worth, Texas to Glacier, Montana and were impressed with its performance and comfort. We then purchased one for ourselves in 2007 and again happy for the same reasons. I like the Sleek lines and the headlights and taillights, I also like the wide low stance. The 4.0 L is a powerful engine mated to a great 6 speed automatic that works very smooth, and the pick up is better than most V-8 engines. At 74,400 miles mpg is still excellant, power is still consistantly great. the pacifica is very spacious on the inside for all three rows (if equiped) and if you need to move anything large then the seats fold down nicely and spaciously. 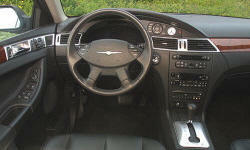 the leather is easy to clean and heated seats are a plus. Even my wife, an ample woman with recent back surgery, is very comfortable. They style was unlike anything else on the road at that time. Everything else looks like it came out of a cookie cutter. I love the low stance of the front, sleekness of the lines. It large but not tall.